At long last, we drove by the local lake last Saturday and it was half melted. The following Tuesday, it was 100% clear. Grinning ear to ear, I knew that my first kayak fishing trip of the year would take place in the near future. Needing some photos for an article with an end of the month deadline, I wanted to get out on a nice, warm, sunny day to fish and break out the camera. So, I picked an afternoon that looked perfect, planned some time off, and rendezvoused with a friend of mine, Craig, who I also suspected was itching to hit the water. 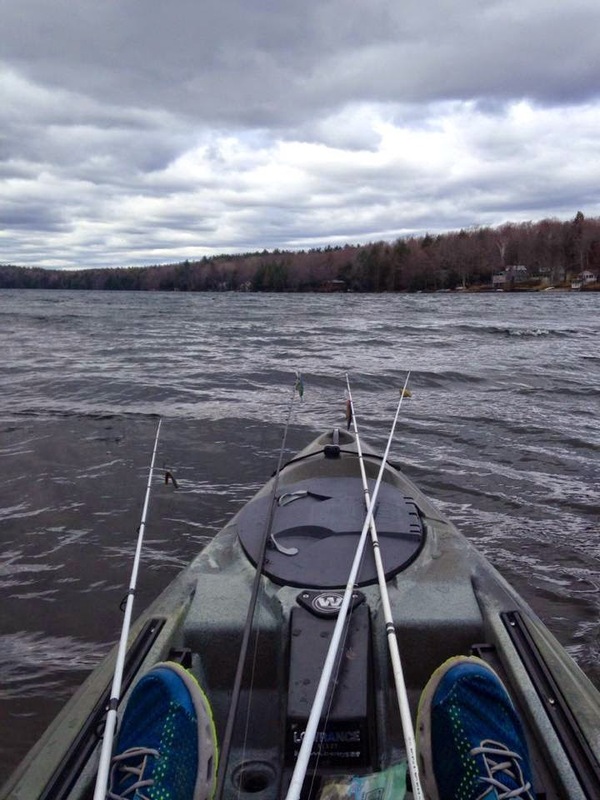 Craig bought his first ever fishing kayak over the winter and was eager to try it out. But as mother nature always seems to do, she threw a wrench in our perfect day. Instead of 65 and sunny, it was 53 degrees and windy, with a "real feel" temperature of 43. The wind was blowing a consistent 15 MPH and gusting to 25+ MPH. But we looked at each other, shrugged, and launched without batting an eye. The rest was up to the fish. Winter was beautiful, but way too long! Rarely do I use the phrase, "it was just nice to get out and throw a few casts." Let's not kid ourselves - I take pride in catching fish in all conditions, not in simply casting and paddling around. But after that long, brutal winter, I felt pure joy just dipping my paddle in the water. Speaking of the water, it registered a balmy 42 degrees. I feel like I should invent a new metric for kayak anglers based on water temps and wind speed in the spring. If the water temp (WT) minus the wind speed (WS) is less than 25, just stay home. Now let's go mathematical. If, 25 < (WT-WS) < 45, be prepared for a serious challenge. From 40 to 60, the metric would get pretty complicated, but you get the picture. On the first trip of the year, our WT-WS was 28 (not including gusts), and per above, it was a serious challenge. And as if we needed to make things harder on ourselves, neither of us had ever been to that lake before. We unloaded, rigged the kayaks, crossed our fingers, and launched. I started off fishing fairly shallow and on initial drops with a jerkbait, lipless crankbait, and spinnerbait. After 30 minutes, it was clear that the fish weren't shallow, nor were they active. The only thing I did see were yellow perch - some in schools of hundreds. They weren't big, but I was hoping it might be a piece of the puzzle. I switched to a deep diving jerkbait, perch pattern shad rap, and small paddle tail swimbait. I really wanted to fish a jig or drop shot, but the wind made it impossible from a kayak. Thankfully, it wasn't long before the switch to the DD jerkbait paid off. I cast parallel to a high cut bank, about 20 feet from where it met the water. I slowly worked the jerkbait back to me. As I did, I felt it deflect off of a submerged piece of wood, so I gave the bait a long pause. As I began to reel, I felt the characteristic bite of a cold, sluggish fish. It feels more like dead weight than largemouth bass. The fish slowly latch onto the lure rather than crushing it with reckless abandon, like what will occur in another 10 days or so. Without putting up too much of a fight, I landed the 14.75" greenback and was happy to call it my first fish of 2015. My first fish of the year - slimed! I snapped a quick selfie and resumed fishing. In truth, I hate selfies. I've only ever taken a few, and they have either been with a fish or to document ridiculous facial hair changes during the shaving process. Given the conditions, I figured a selfie would suffice, as Craig was on the other side of the lake. I paddled back up to the spot I had just caught the fish, took another cast, and began slowly retrieving the bait. During the early spring, a lot of largemouth stack up in key areas, so if you catch one, there are often more in the vicinity. On this cast, I got no deflection, but I did slow my pauses to nearly 10 seconds. Sure enough, in the same area, I got a thump. This fish felt heavier and put up a bit more of a fight. I saw him in the clear water and knew it was a solid fish. Eventually, I maneuvered my fingers around the treble hooks and lifted the brute into the air. The fish measured about 18.75" and was probably a little under 4 lbs. I again snapped a selfie and let her go. The big fish of the day and the DD X-rap it ate! After a couple of fishless casts, I floated over the area where I had caught the fish and noticed a brush pile in about 8 feet of water. If there is a better place for catching early spring bass than brush piles in 8-15 feet of water, I'd like to hear it. I managed to hook one more fish on another piece of deep timber about 30 yards down the bank, but it managed to hang me in a branch and shake the hook. About this time, the wind went from strong to nearly unfishable. I was blowing faster than I could reel in my lure, making for very short, inefficient casts. The lake was shaped like a finger, with almost no place to escape the building swells. Before I knew it, we were both at the far end of the lake. However, there was a small corner there that provided some protection and an adjacent pseudo-rip rap wall, to which I began casting. I was throwing a flat sided, coffin bill crankbait, a favorite choice of mine for colder water or pressured fish. Suddenly, I felt a fish slap the bait and get hooked momentarily, only to pull free. After a few more casts, there was only one thing left to do, paddle back up the lake toward the launch. I shuttered a bit as I watched white caps rolling across the 55 acre lake. I snapped a quick pic and began paddling. The BB Angler Pro was my savior, as waves crashed over the front of my Ride 115, spraying my legs and face. Although it isn't the fastest boat, it actually handled the waves pretty well and I made better time than expected to a small sheltered area close to the launch. Of course, I had to stop and fish the brush pile once more with Craig. The wind din't make it easy, but I managed to get a cast in the vicinity, reel it to depth, give the bait a couple jerks, and then a very long pause as I adjusted my boat in the wind. As I reeled up my slack I felt fish number 3. His fight was nearly non-existent, but the 14" bass would have given me a 3 fish limit for the day. Given the conditions, I was tickled pink. We fished back to the truck, loaded up, and decided to go scope out a smaller, adjacent lake. It also had a rip-rap wall, which we decided to fish from land. It turned out to not be very kind to me - snagging one of my crankbaits that I couldn't get to come free. But for Craig, it was a good ending to the trip. He hooked a solid bass before it spit the hook right next to the bank. Then he hooked another greenie, and this time, got him to shore. It was a solid 14"-15" bass, which hit his lipless crank along a rocky point. It was also a perfect ending to the day. We certainly couldn't complain - 7 hook-ups, 4 fish landed, a free workout, and a great baptism by fire for our new kayaks. A big kudos to Craig, who never even batted an eye at the rough conditions. I really like the look of those lakes and suspect that they are going to be red hot in another 10-14 days - and possibly even better in mid-summer when the vegetation hits full strength. Now it is back to reality - work, house building, writing, editing, necessary evils, and day dreaming about fishing for a little while. Until then, tight lines! I'm not sure if Aaron Stiger can be any busier. I first linked up with Aaron via social networking a year or two ago. Since, I've seen his name pop-up with a multitude of projects and organizations. As advisor to the Duke University Fishing Club, I am very excited about one Aaron's biggest projects, College Kayak Fishing, where he serves as Tournament Director. I am also proud to call him a teammate with Bending Branches. In addition, he is a Jackson Kayak Fishing Team Manager and Team Member, River Bassin Tournament Trail Assistant Tournament Director, Kayak Fishing Ohio Assistant Tournament Director, Manley Rods Pro Staffer, Astral Pro Staffer, 412 Bait Co.Team Member, HOOK1 Crew Member, Kayak Kaddy Pro Staffer, KJ’s Custom Lures Pro Staffer, Yak Addicts Pro Staffer, S.W.O.R.D. 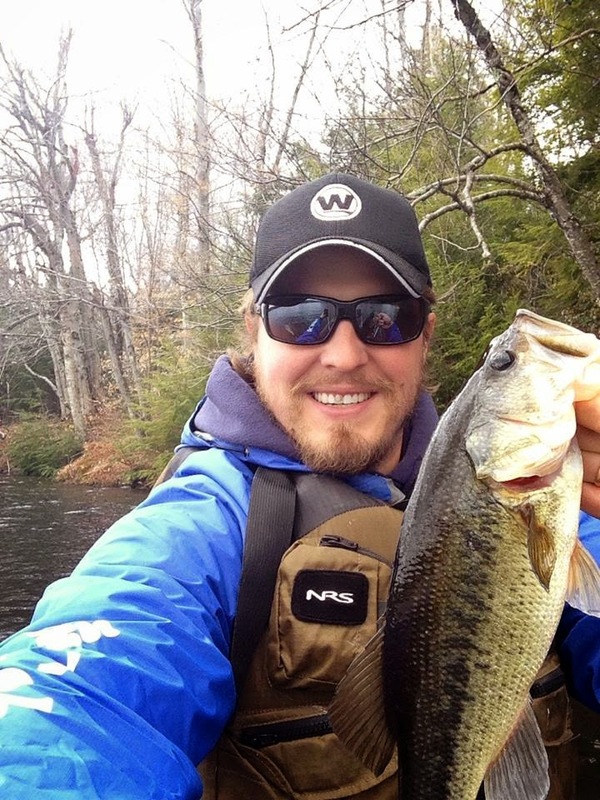 Performance Drink Pro Staffer, and contributor to multiple kayak fishing publications. Thankfully, Aaron took some time out of his crazy schedule to answer some questions. And as usual, he did not disappoint! 1) Dave Attel is a comedian who formerly had a show on Comedy Central called "Insomniac" where he toured the U.S. and visited various cities and states late at night. When he left Ohio his comment was, "the best thing about Ohio is packing up and getting out." However, I know you are a proud representative of OH and the fishing community there. Can you tell us why Dave is wrong and why you kayak scene there is so strong? There’s nothing to argue from my end about the weather in the “Buckeye State.” However, as much as I enjoyed Dave, he was obviously not a kayak fisherman. Ohio, like many states, has its own unique set of gems that are largely untouched by the kayak community. Looking North, Lake Erie is appropriately named “Walleye Capitol of the World.” I have enjoyed catching 30+” walleye out of the big pond during the spring. Pulling in 10lb walleye from a kayak is something you can only do in a small handful of states, Ohio being one of them. Now- speaking of Lake Erie, it is quickly becoming a smallmouth Mecca. I know a lot of southern boys in the Heart of Dixie and the surrounding areas love their pigskin, but my kind of football is hammering the Lake Erie bronzebacks. The smallmouth population up there is thriving on the ever growing goby population. 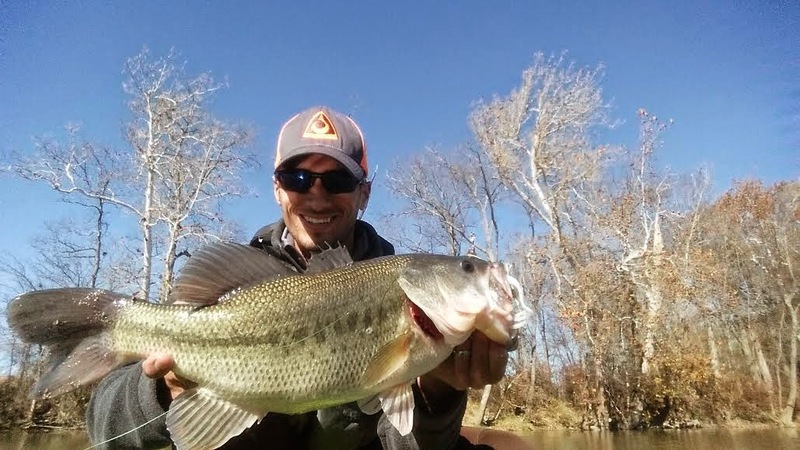 Laughably disproportionate and aggressive, these chunky fish are a blast and right in Ohio’s backyard. Some of my favorite moments are fishing the gin clear waters of Erie, sight casting Carolina and drop-shot rigs at 20+ inch smallmouth, as they rest in 10 feet of water on their rocky homes below. But Lake Erie is only one part of the state. Ohio stocks multiple species of fish in our reservoirs and rivers. From bass to crappie and over to saugeye, catfish and white bass, an angler can find multiple species of fish in a single outing on a local impoundment. The pressure on Ohio waters is tremendous, however and it takes lots of skill, and a little bit of luck to have a truly successful outing. I frequent my little river right behind my sleepy rural Ohio town to get away from it all, especially in the summer. Ripping the lips of hundreds of smallies out of skinny water is one of my favorite past times. On the southern boundary of the state, the mile-wide Ohio River flows steadily and powerfully. It holds some of the meanest, strongest fish in the state. Chasing trophy hybrid striped bass and dinosaur-like gar is one of my favorite addictions during the spring and summer. There’s nothing like the freight-train of a 15 pound gar on the other end of your line or the aggression of the paddle-blade-sized shimmer of a hybrid as you reel it in. The other factor that gives Ohio the nod is the community of anglers who reside here. In my opinion, this kayak fishing community is growing and thriving as fast as any other throughout the nation. 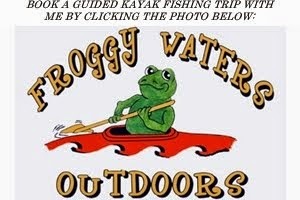 I help run Kayak Fishing Ohio with anglers across the state. We are continually growing as people continue to get hooked on the sport. It makes me very proud to be a part of it all as this industry I have so much passion for expands out of its shoes. All in all, people who dismiss Ohio are missing out on a great opportunity. It is truly lacking few resources and provides an ideal habitat for fish to flourish, and anglers to be entertained. 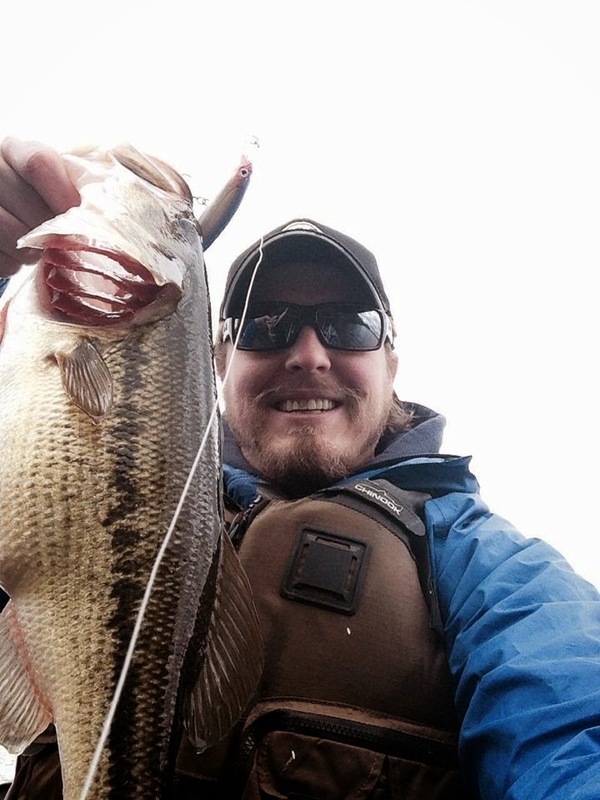 2) This year you've become the headman for College Kayak Fishing, which has great potential. As an advisor to the Duke Fishing Club, I know how hard it can be for a lot of students to not only find out about fishing opportunities, but also afford gear. What are some things that CKF is doing to branch out and get as many schools as possible involved? Is there anything experienced kayak anglers can do to help? I am fortunate and blessed to have been afforded the opportunity to be the Tournament Director of College Kayak Fishing (CKF). As a high school educator, I have a big passion for the growth and development of youth in various arenas of their lives. 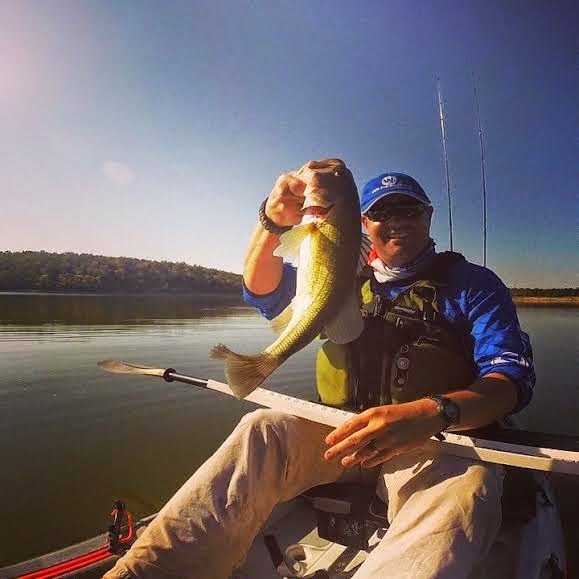 One of the most prominent functions of College Kayak Fishing is to provide anglers with the information and tools necessary to organically build self-sustaining kayak fishing clubs at their universities. CKF facilitates positive working relationships with collegiate anglers to seek sponsorship through their universities and outside businesses that actively contribute to the industry. By doing this CKF helps the up-and-coming anglers participate more readily in events across the nation. In these ways, we facilitate affordability and accessibility to anglers. Another major task we do with CKF is to work with local shops and liveries to provide kayaks for free or drastically reduced rates to collegiate anglers. This is never an easy process, and it creates several moving parts. However, the dealers are the lifeblood of this organization and why it is able to thrive. Without their generosity, CKF wouldn’t exist, as anglers could not fish from a kayak. It would just be called CF! Some local clubs really step up and help out where they can. 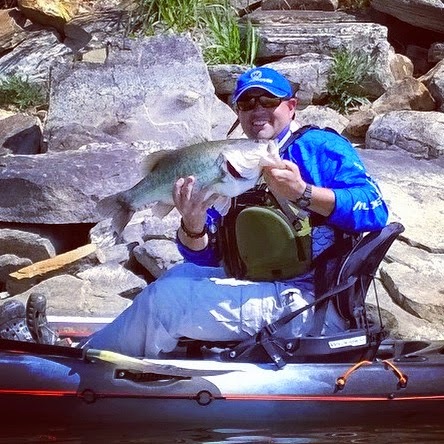 Whether it is through kayaks, gear, or mentorship on the water the day of the event, the kayak fishing community is often seen in full force helping these youngsters out, and growing the sport the right way. We have some very progressive ideas about how to continue to grow CKF in the future, and I can’t wait to see what unfolds! 3) You recently received an Ohio Master Angler Award. How does the award work and what catches earned you that recognition (including species, length/weight, and what you caught them on)? Ohio has a recognition program called “Fish Ohio!” Under this program, there are several species that qualify for the award. You can get individual “Fish Ohio!” recognition. However, I you catch four species, you are awarded “Master Angler” status. I kind of chuckle, because I don’t consider myself a “Master Angler”- I just enjoy the challenge of fishing! All of the species I mentioned above qualify except for gar. However, the program runs for one calendar year, and each species you catch over the required length is considered a “Fish Ohio!” Getting one or two of these fish per year for an angler is a very solid accomplishment, as true “Fish Ohio!” sized fish are difficult to come by. However, last year, I made it a point to really go on the hunt for true trophies, and fished waters that held these trophies multiple times in pursuit. When it was all said and done, I had several “Fish Ohio!” sized fish in 5 various species. Walleye qualifying length is 28”. I did not participate in “Kayak Wars” but I would have the record by over 2 inches if I did in the walleye category. I had a couple of ‘eyes over 30” and pushing 10lbs last year trolling Husky Jerk Deep Divers over the reefs. Lake Erie is just that good of a fishery! The largemouth bass qualifying length is 21”. I had several over 20” but one did measure over 22” and was one heck of a pre-spawn toad. She crushed a topwater buzzbait of all things. When I got her in she had a nice keeper crappie in her gullet flapping its tail. She went around 6.5 lbs. The hybrid striped bass qualifying length is 21”. That qualifying length is not difficult if taking a trip to the Ohio River in prime conditions. I was using a 412 Bait Co Yoda in Salt and Pepper, and hybrids approaching 28” and 10 lbs were hammering my baits. The funny thing about hybrids is they sit in the strongest current you could imagine. I actually flipped my kayak the current was so strong and lost all of my gear on one trip. Very scary moment there. Freshwater Drum is another category for “Fish Ohio!” Making a few trips up to Lake Erie and you can have a handful of these, and my biggest last year was again, right at 10lbs. The sow-bellied drum was only about 24” long beating the required length by 2”, but looked like it had a bowling ball in there. The fifth species of “Fish Ohio!” Length I was fortunate to catch was saugeye, which I will talk about a bit later, but are a challenging, but rewarding fish to catch when you can! At 23” it was a treat, and 2” over the “Fish Ohio!” length. I also had three species, which were each within ¼” of the award, and they were smallmouth bass, channel catfish, and crappie. 4) You can pick one kayak fishing destination/trip anywhere in the world...what is it? As crazy as it sounds, an Ohio boy has never made it salt fishing. I’ve been to the ocean plenty of times, just never in my kayak. I want to experience salt water fishing from the kayak. Whether it is red fish, flounder, specks, snook, or even sharks, I just want the experience! Heck, I think right now, I just want some warmer weather. 5) Most kayak anglers are up before the sun and on the road to chase fish. What is playing in your truck to wake you up and get you pumped? “Cruise” by Florida Georgia Line. Great song! 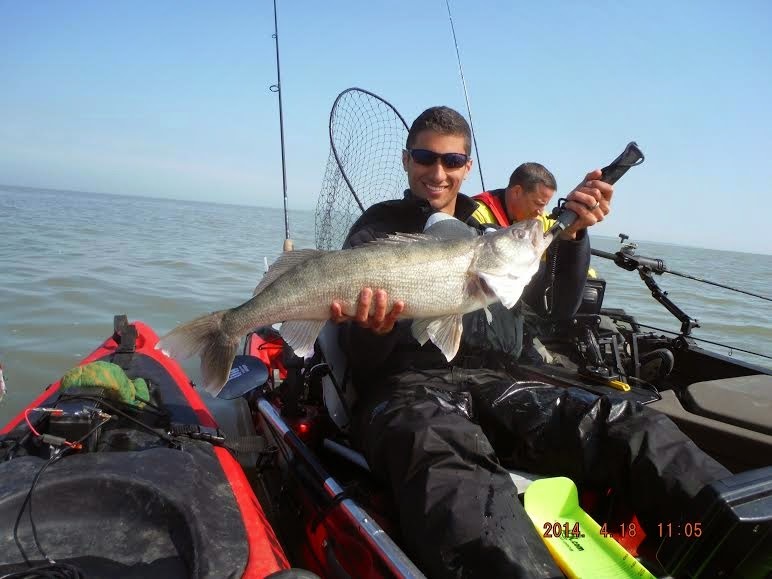 6) Walleye and sauger tend to be less popular species for kayak anglers. So, if readers wanted to chase them, what are 2-3 techniques or baits that work well throughout the year? One of the big reasons these fish are not targeted more is because they do not live in the ponds, lakes and rivers abundantly like bass do. Walleye are not common around Ohio, only living in Lake Erie and a couple of impoundments. So targeting them from a kayak takes knowledge and commitment. But to target them on Erie, find about 22 feet of water along a mud line. Fish the warmer water, which is right on that mudline in the spring when it gets about 40 degrees. Pull Husky Jerk Deep divers and Reef Runners, use your electronics to locate pods of fish and hold on! 7) On an average week, how many hours do you think go into something kayak fishing related? How do you offset that time with work, family, friends, etc.? Oh boy, I’m almost embarrassed to answer this question. I’ll start off by saying I have the most loving and empathetic wife a man could ask for. She puts up with my hobby turned obsession, turned career. Between being the Director of CKF, Fishing Team Manager for Jackson Kayak, and Assistant Director of River Bassin, I put in about 35-40 hours a week for these roles on top of my job as a high school teacher. It is a lot of very hard work behind the scenes. However, I am so lucky, fortunate and blessed to be in the position I am currently in, and I wouldn’t trade it for anything. 8) What is your favorite kayak fishing memory? My favorite memory is up on my family’s lake house in Ontario, Canada. We have a cottage that sits on a medium-sized lake and this place is full of smallmouth, largemouth, pike, walleye, perch- you name it. Last year I took my younger cousin, who was in 8th grade, out fishing on one of the spring-fed streams that feeds the lake. Many times you can catch all kinds of fish out of these rivers. I was bass fishing- I had a Texas-rigged plastic on, and he had a brand new KVD 1.5 crank bait I had given him. These rivers are not deep, maybe 2 or 3 feet, and I told him that crank was likely going to just drag the bottom, and may not be the right choice. Soon enough, he showed me otherwise, as he pulled a 32” northern pike out of a section of the river no wider than the office room I’m typing this story in. He didn’t bring a net, and landed the fish with his bare hand, by putting his hand up in the gill of this fighting fish. I was so proud of him! His awkward 13-year old, crooked smile and laughter told the story best. That is what gives me the most joy in this sport- spreading my passion and knowledge of kayak fishing to others! A trip like that got him hooked and he fished other local tournaments in Ohio with me after that in 2014. He will be a kayak angler for life! 9) You're being forced to fish out of a tandem kayak - who do you want in the front for a fun day on the water? How about on tourney day? Hmm, well if they are in front, I definitely want someone who is conscientious about their back cast so I don’t end up with a treble hook in my arm! Ha! But, joking aside, I think it would be a blast to fish with one of my buddies, Larry Schuster. He has an awesome sense of humor, and has been known to crack a joke or two to my demise. However, Larry is someone I consider a great friend and a guy I have a ton of respect for. If it was a tourney day, I would sit and watch my friend Donald Corbett. In my opinion, Don makes the some of the best soft plastics out there in 412 Baits, and he flat out knows how to fish them. I believe he had 6 top-3 tournament finishes last season alone. He has given me a few lectures about colors, presentation, cadence, weather patterns, and more. The preparation and foresight he puts into his typical tournament day is impressive. I fish against Don a few times every year, and it would be awesome to just sit and watch for a day. 10) Give us one piece of advice for beginner kayak anglers? How about for mid-level and top-tier folks? For novice kayak anglers, my piece of advice is to get plugged into your local kayak-fishing scene. Sometimes it is a tournament trail, other times it is informal meet-ups with guys and girls you meet on a forum. Either way, this community is more of a brother and sisterhood. So much knowledge that I have now was passed down to me by some of my closest friends within this network of local Ohio anglers. For that, I am grateful and excited because I know that it continues to happen on a daily basis for others as well. For mid and top-level anglers, I would give the advice to really evaluate what you want out of the industry. Is it tournament wins? Is it publicity? Is it building a platform through writing? Is it to run a tournament trail? Is it to pro staff for companies and represent their brands? Is it to start a guide service? Or, is it to just go out and have fun to de-stress? The funny thing about kayak fishing is that it is such a niche market, where seemingly everyone knows everyone to an extent. However, it is expansive enough to really market yourself and grow in whatever way, as much or as little, as you wish. I think it is very important to determine your ultimate motives, goals, and values as your involvement grows in the industry. Then, once you figure those things out, know that only by putting in hard work and applying your skill set, will you reach your fullest potential.